Why are Fire Hose Racks Important for Your Fire Station? In a fire station, keeping work areas orderly and organized is about more than just appearances; it is about making sure all of your equipment works properly and is easy to access. When the alarm sounds, there isn’t time to sort through a pile of fire hoses to find the right one. Also, improperly storing fire hoses can cause them to be defective, and that isn’t something you want to discover during a run. 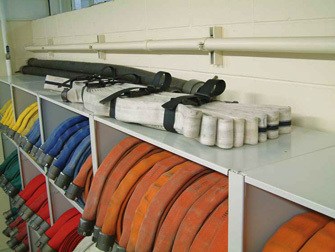 Fire Hose Racks are the best solution for keeping hoses organized and ready to use at a moment’s notice. 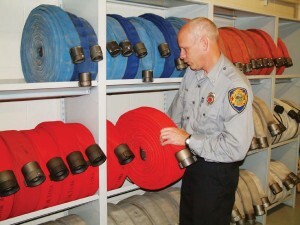 A fast and efficient way to store a fire hose is to coil it up and store it vertically into shelving. Coiling a fire hose up and storing it vertically in shelving is a fast and efficient way to store it; however, using traditional systems with flat shelves to store the hose won’t keep it secured in place. What makes more sense is to use a cradle style shelf like our Fire Hose Racks that will conform to the circular profile of a coiled fire hose. The Fire Hose Racks give you the ability to grab any fire hose without accidentally pulling another one off the shelf. In addition, you will be able to fit more hoses in the available area and maximize your storage density. If you still need a place to keep spare parts and tool packs, the top of the rack provides an ideal spot for these items. A fixed shelf isn’t as good for fire hose storage as an adjustable shelf because it doesn’t accommodate coiled hoses of different diameters. Adjustable shelving on our Fire Hose Racks will enable you to make the most out of your storage because you can move the shelves up and down as needed. You are also going to need a storage system that is extremely durable because fire hoses aren’t light-weight. Our Fire Hose Racks are constructed out of heavy duty steel and have a powder coated finish to offer extreme strength and longevity.